Calling all makeup enthusiasts! NARS are running an Instagram challenge in association with Selfridges’ annual Bright Young Things campaign and it’s a fun one if you love to experiment with bright looks and colour cosmetics. Every week since the 30th August, NARS have been setting a weekly challenge inspired by an iconic bright shade and inviting Facebook fans to submit their boldest and brightest beauty look. The winner each week wins a limited edition makeup bag with five products and then the overall winner gets a one day artistry session with International Lead Stylist Jane Richardson and the entire NARS Fall colour collection. Woo! This week the challenge is blue. I hope that you can tell that from my effort! I have to say that I’m not usually partial to blue so I found this challenge quite difficult – I’ll be interested to see what you come up with. You have a week from today to get your entry in – all you have to do is post a photo of your look onto Instagram with the hashtag #NARSBYT and detail the NARS products that you’ve used. NARS will select the most creative submission as the winner. Which I doubt will be mine – I’ve had a look at some previous entries and I think I’ve played it a little too safe! So go crazy. I used the Duo Eyeshadow in South Pacific (so pigmented it’s unreal, amazing!) and then the electric royal blue ‘Outremer’ mono with a slick of the Larger Than Life eyeliner in ‘Abbey Road’. 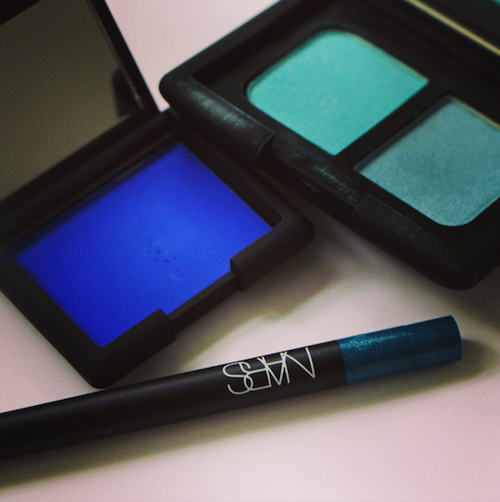 You can find out more and see the challenge at NARS’ Facebook Page: facebook.com/narscosmetics – this post has been sponsored by NARS. Next Post Slippers with a Heel. Kind of.